We offer a selection of beautiful money boxes in innovative designs and solid craftsmanship. Available in several colors, our collection of money boxes is sure to get the attention. Consider our line of money boxes for your special occasion. The Floor Heart Envelope Box is uniquely designed with gentle scrolling swirls, easy access swinging envelope door and sturdy extension base with arm. The dimensions are 72” tall, 28” wide and 13’ Deep. This elegant piece will surely make a lasting impression with your guests and family. 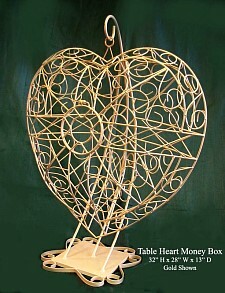 The Table Heart Envelope Box is uniquely designed with gentle scrolling swirls and easy access swinging envelope door. The dimensions are 32” tall, 28” wide and 13’ Deep. 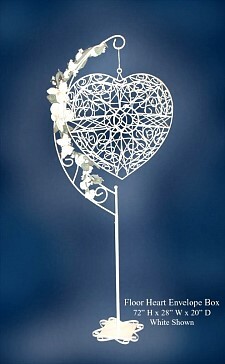 This elegant piece will surely make a lasting impression with your guests and family. 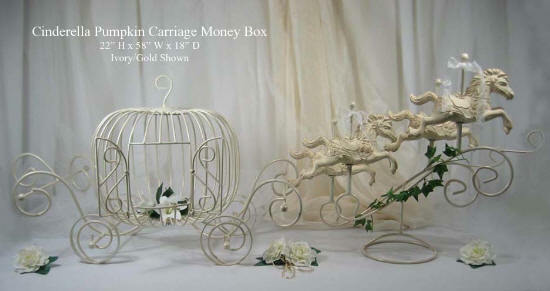 The Hanging Birdcage and Bell Box are traditional envelope box. The perfect accent for your out door wedding or special occasion. The sturdy wrought iron design is uniquely constructed with clean lines and Victorian curls. The overall dimensions are 72”H x 24”W x 14” D with a cage size is 27 ”H x 14”diameter. 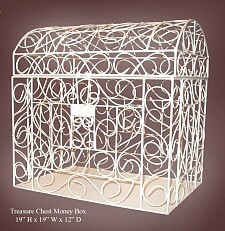 The Treasure Chest Money Box is a charming design with a dimension of 19” H X 19” W X 12” D. The sturdy construction and swirling pattern is a traditional favorite. The lid with envelope slot is attached to the base by a hinge. All fantasies come true with this elegant horse drawn Cinderella Pumpkin Carriage. Designed to hold gift envelopes, this authentic design with replications of hand painted merry-go-round horses and detachable wrought iron stands is sure to make a statement with all your guests. Finished in Gold, Silver or Ivory Gold.